The skills covered are choosing equipment, personal touring skills, including skinning, using ski crampons, boot and crampons and ice axe. We will also look at personal organisation and mountain safety, glacier travel, backcountry route selection and planning , avalanche awareness and group management for backcountry touring. 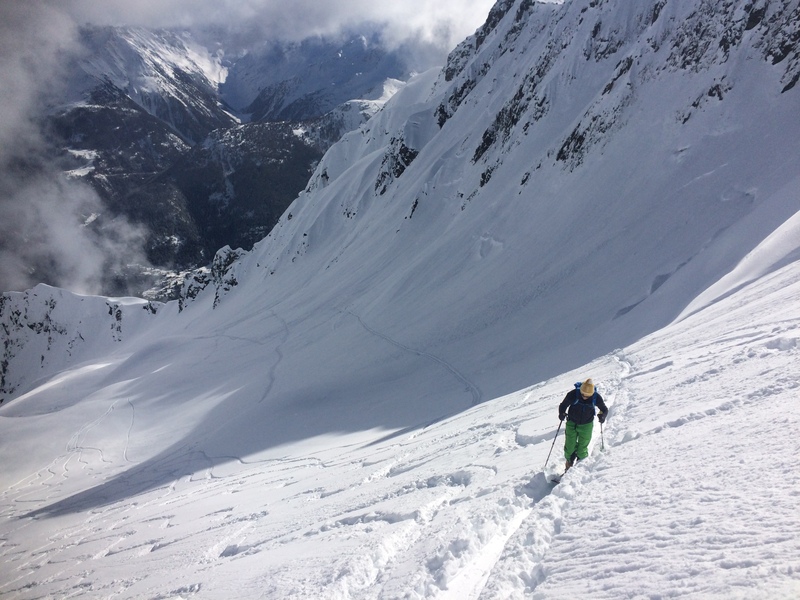 There will also be input on downhill off-piste skiing, with tips and advice for skiing in all types of backcountry conditions. Pre-requisites: Some previous lift-served backcountry skiing experience, and the ability to link turns on ungroomed slopes of up to 30 degrees steepness. You also need a basic level of fitness, to be capable of ascending at a rate of approximately 250-350 metres per hour for 2-3 hours each day. If you have any questions about your suitability for this course regarding skiing level or fitness level, please get in touch with us and we can advise you accordingly. The course is based in Chamonix, with options to ski in the surrounding areas, perhaps even in Italy or Switzerland . We may sometimes use lifts to access ski tours, or we may be able to start touring from the road, so we will buy lift passes on a daily basis if necessary to make the most of the conditions and weather on each day. The itinerary will start with an introductory day in or near a ski area, looking at equipment and basic skills, before heading out on day tours for the rest of the week. We will try and include ski touring on a glacier, and the option of an overnight tour to include the use of a mountain refuge will be offered if conditions and weather are suitable (refuge cost extra). Cost of £600 per person is based on a minimum of 4 people attending, up to a maximum group size of 6. Includes guiding, instruction, transport from meeting point to and from daily venues and all safety equipment. Does not include: Accommodation, travel to and from the course, personal ski touring equipment, insurance, ski lifts, and all Guide’s expenses away from the Chamonix valley. Ski & boot hire can be arranged for you.